Two men with the same name: both born in England in 1791, both members of the Church Missionary Society (CMS), both men who would return to England to die after many years in the colonies. One Benjamin Bailey would count the poet John Keats as a dear friend, perhaps even influencing the writing of Endymion. He would be a humbler sort of poet himself; publishing a collection titled ‘Poetical Sketches of the Interior of Ceylon’. Posted to the island to serve as a Senior Colonial Chaplain in 1832 and widowed that same year, this Benjamin Bailey would write grief drenched sonnets and wax lyrical on the beauty of the natural world. He would leave Ceylon on less than cordial terms with his colleagues, but only after he had ascended to become Archdeacon Bailey of Colombo. The second Benjamin Bailey would outlive his counterpart by 18 years. A member of the clergy, assigned to Kottayam in India he and his wife Elizabeth travelled there in 1816. She became one of the first to give native Syrian Christian girls an English education. He became the principal of CMS College and founded the CMS press, earning himself the title of the Father of Printing in Travancore. Filled with missionary zeal, Bailey would translate the Bible into Malayalam and design the Holy Trinity Church in Kottayam. He would become the first Bishop of what is now the hugely influential Church of South India. Despite their identical names, it’s hard to imagine mistaking one man for the other. But had it not been for Dr. Rajpal (R.K.) de Silva stumbling upon a leather bound copy of Poetical Sketches, perhaps the two Benjamins would have been entombed forever in history together. Now, he intends to republish the original manuscript, complementing Bailey’s poetry with a rich set of appendices that detail the biographical and historical context of the time. The book joins Rajpal’s earlier publication on Ceylon. 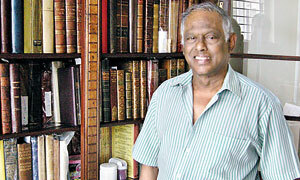 An avid collector, he has always been passionately interested in Sri Lankan history and art, publishing his finds in ‘Early Prints of Ceylon – Sri Lanka, 1800 – 1900’, ‘Illustrations and Views of Dutch Ceylon, 1602 – 1726’, ‘19th Century Newspaper Engravings of Ceylon,’ and ‘Maps and Plans of Dutch Ceylon’. Rajpal unearthed his latest manuscript in the “dungeons” of an antiquarian bookshop over 30 years ago. He first noticed it because upon its worn brown spine was a name in gold lettering that alluded to Ceylon. It was one of several finds, he tells me today. He keeps the book wrapped and stored in a box and when he carefully opens it, we see pages filled with intricate, rapidly fading little whorls of flowing sepia script. It’s hard to decipher without a magnifying glass. Still there are small mercies to be had. This could have been written in Bailey’s handwriting, which was quite frankly appalling. Instead, this is most likely the work of his daughter Janet, says Rajpal. The words however, are very much the man’s himself. He writes, as if to his late wife: ‘Here resteth all of thee that Death/ had power to take with thy sweet breath; I would my dust were here, and I/ now shared thine immortality.’ Though his grief is evident and moving, his apparent detachment from the social and political milieu is anything but endearing. “I actually found it a little annoying,” says Rajpal pointing out that Bailey landed on these shores in uneasy times. During his 20 year tenure, Bailey wandered around admiring the scenery while the island underwent upheavals and unrest, many of which were born in the Kandyan and Uva regions. The 1847 rebellion in particular, fuelled by anti-British sentiment, spread to Colombo and other coastal areas. In an attempt to recover from a financial crisis, the authorities adopted ridiculous, inflammatory measures: people were taxed for owning dogs and carts and the freshly minted Road Ordinance demanded that all men (except monks) between the ages of 18 – 55 pay a ‘commutation tax’ of 3 shillings or sign up for 6 days of manual labour on repairing roads. Rajpal seems amazed that all this drama did not register on the good Rev. Bailey’s radar, and so he has obligingly included the detail in his appendices. Aside from the political commentary, the biographical details and the comparison of the two Baileys, he also devotes a significant chunk to exploring the unlikely friendship between Bailey and Keats which began in the spring of 1817. By the September of the same year, Keats and Bailey were sharing the latter’s rooms overlooking the main quadrangle of Magdalen Hall in Oxford. It was here that Keats composed the third book of his famous poem Endymion, which begins with the now immortal line: ‘A thing of beauty is a joy forever!’ Bailey, whom biographers delighted in labelling “stuffy” and “pompous,” nevertheless succeeded in keeping the mercurial Keats well entertained. They went walking and boating, discussed Wordsworth, Chatterton and Milton and in their last few days together visited Shakespeare’s Stratford-upon-Avon to pay their respects, writes Rajpal. When they parted it was with ‘much real regret and real affection.’ And by this time, Bailey had also succeeded in wringing a promise from his sceptical friend – Keats agreed to never scoff at religion. In return, he had found a staunch defender in Bailey. Rajpal has also found an unexpected personal resonance in the conflict between Bailey’s faith and Keats’ scepticism. As a paediatrician who practised in the UK for a long time, he says he has seen more than his fair share of miracles. Now in his eightieth year and long retired, he might even consider writing a book about his professional experiences. His real love however is travel. He has been to most of the world’s great historical sites. Even there, there are such stories to be told: for instance, a journey by road from London to Sri Lanka he undertook in a car with a friend and three children (he took the ferry from India to Sri Lanka) should be a book by itself. “No one could do that now,” Rajpal says, pointing out that such an excursion through modern Afghanistan could easily end with fatalities. Still, for the man who drove over the Khyber Pass, there will always remain the temptation to make the return journey. Published in the Sunday Times, Sri Lanka on 4 December, 2011. Words by Smriti Daniel. Pix by Athula Devapriya. Tags: Will the real Benjamin Bailey please stand up? A collector of antiquarian books untangles two lives.. Bookmark the permalink.